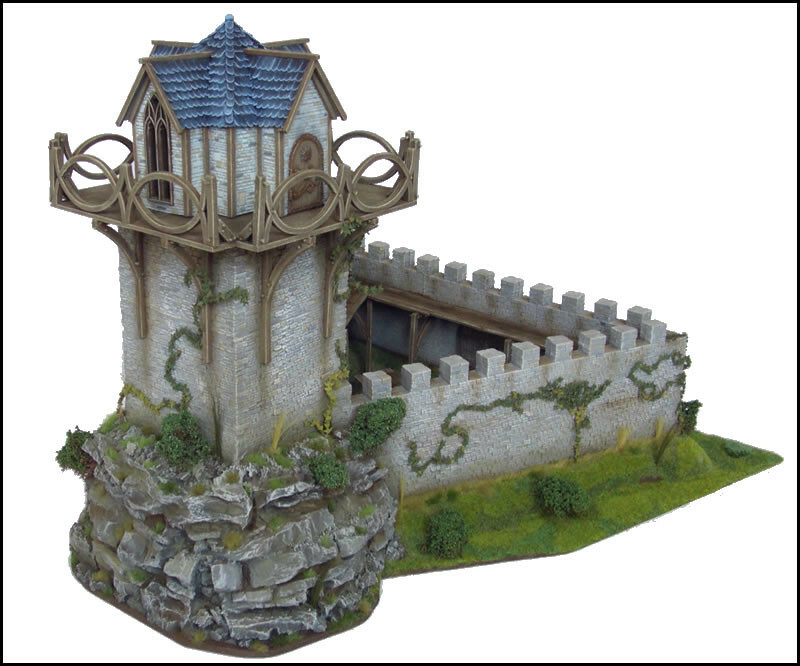 This is a subject that I've been thinking about recently, there aren't any real options available on the market for an elven castle or fortress for siege games. Since the latest rules expansion for Kings of War has siege rules that I really want to try out, I'd like to have one that looks elven. I've accepted the fact, that I will probably have to make one from scratch, but since I am not a designer, I'm not sure how to go about making one. Years and years ago I had some elven watchtowers and small fortress walls but they've long since gone in the tip. Shame really because I was well into Art Attack and loving the pva at the time. I think I used some artwork from the 5th edition rules and some art from lotr. Tall peaked designs with sloping arches, lovely domes etc. I made metallic bronze rooves as opposed to the usual blue. There have been a few HE terrain posts here over the years. Though I can't find back most of them and from the others the pictures disappeared. I did find this link: http://forum.oldhammer.org.uk/viewtopic.php?f=8&t=6550&start=80 for a HE castle. I myself have been looking at Hirst Arts molds for terrain making. They offer a lot of very nice molds which lets you cast your own building blocks for terrain making. Some very generic stuff but also some more specific and detailed items. They've been getting some great reviews online. So they are definitely an option if you want to go down that route. If you have access to a 3D printer, then I guess there's lots of options available for that. Though it might take some searching to get nice printable plans. So. I've decided to go the 3D printer route. I'm a civil engineer. I say that only because 3d modeling is right up my ally. IF I decide I want to spend more time on the computer for 3d modeling for fun, and not just work I think I'll be able to do some nice designs. We'll see though. Super excited to hear that, Shannar! Any chance you might share your designs? If so, might I make a few suggestions? The plan is to share. And for sure the foam/3d combination is the most powerful. Even back when I was into Hirst arts I tried to match it with foam, simply to same time. What are you Hirst arts experiences? Any models you can share? I very much have a love/hate relationship with Hirst Arts. The results can be fantastic, but you'll put a ton more time into it than you expect. My best advice would be to take 20 mins every day and do a casting with all your molds. This only works if you have a dedicated space so you don't have to clean everything up every time. I don't mean to rush you, but I haven't been this excited about something since I was a kid waiting for Christmas, any updates? Well, the printer has arrived, but I've nothad time to put it together yet. As to any design work, I've only played around with very basic outlines of what I want it to look like. I'll want a lot more interesting details for sure.